Friday Feature: The Carrots are dying, long live the Carrots! It’s true – it’s over. Euskaltel-Euskadi will fold at the end of the season: a bitter pill for Spanish and, in particular, Basque cycling to swallow. A new structure had been put in place at the start of the season with the Basque Cycling Team, moving away from the original philosophy of recruiting only Basque or Basque-developed cyclists and it seemed that the organisation was on a sounder financial footing. 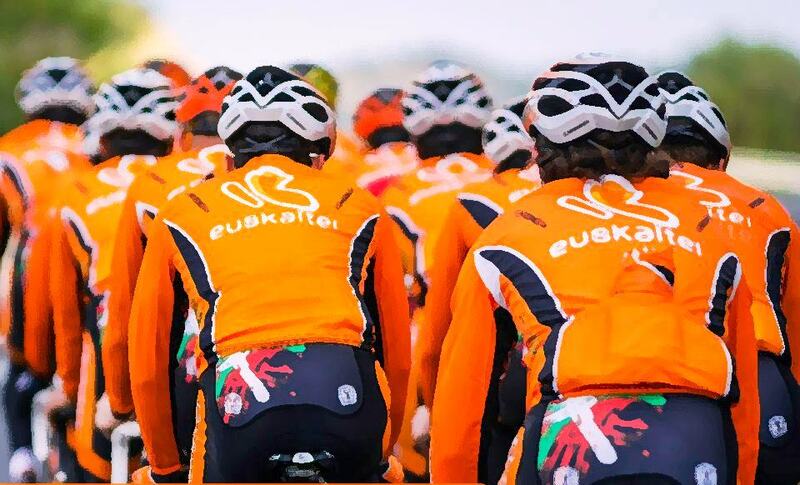 Sadly, due to Spain’s deepening recession, the additional financial support provided from the Basque local government didn’t materialise, which meant that telecoms company Euskaltel had to use next year’s funds to be able to race this year. The company couldn’t sustain that level of backing and the search for additional sponsors unfortunately came to nothing. They are were the longest running team in the professional peloton. Looking back over their history, it appears our beloved Carrots have teetered on the brink of one economic disaster to another during their modestly budgeted existence. Hatched from an idea born during the 1992 Tour de France, at a stage in Lourdes – divine intervention, perhaps – the Fundacion Ciclista de Euskadi was set up to support the development of the team the following year. The team was finally launched in 1994 amid much fanfare, as well as additional financial support from its fan base. 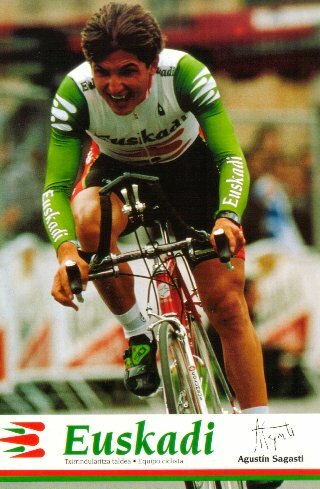 Agustin Sagasti, clad in the green and red of the Basque national flag, bagged the team’s maiden win, appropriately enough, on the fifth stage of the 1994 Vuelta al Pais Vasco. Sadly, the 127 million pesetas raised from over 5,000 sponsors, including many individual fans, proved insufficient and with mounting debts, the team faced collapse and its general manager faced imprisonment. Fortunately, the local Basque government came to the rescue and remained on board until recently. Still in financial quicksand, in 1997 the team was unable to pay salaries. This is when telecoms company Euskaltel stepped into the breach. 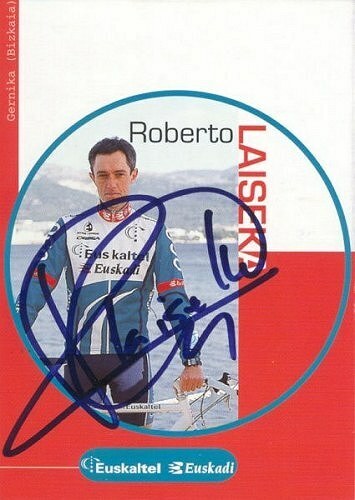 Two seasons later, the team enjoyed their first grand tour victory on stage 18 of the Vuelta a Espana with Roberto Laiseka, who repeated the feat the following year on stage 11. A few kit changes followed until 2000 when the team hit on their winning combination of black shorts and orange jersey. The Carrots were born! Those grand tour successes elicited a precious wild-card invite to the team’s first Tour de France in 2001. Laiseka won stage 14 into Luz-Ardiden and Inigo Chaurreau finished 12th overall. The team has competed at every subsequent edition of the Tour but who could have predicted that the centenary edition would be their last? But let’s not dwell on what might have been. Instead let’s revel in footage of some of the Carrots’ most memorable wins. It could be said that the team have been scorers of great goals rather than great goalscorers and their most prolific servant has also been the longest-serving. Samu Sanchez has ridden his entire 13-year professional career in orange, albeit decorated with splashes of gold in the four years after his 2008 Beijing Olympic road race victory. 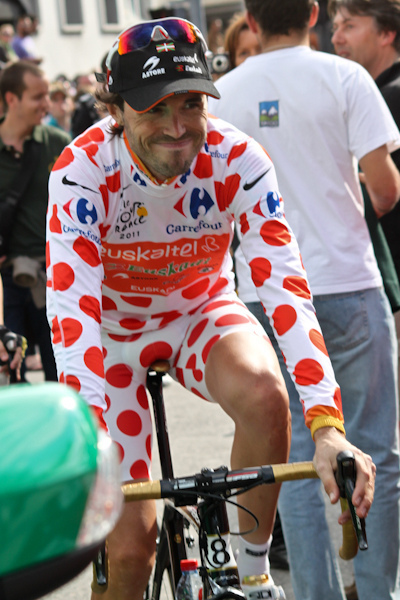 Samu replicated Laiseka’s feat on the stage to Luz-Ardiden in the 2011 Tour de France as he went on to win the King of the Mountains, a year after he finished on the third step of the podium. During his career, he has won stages in both the Tour and Vuelta, only missing a stage win in the Giro to complete his royal flush. Samu’s popular overall victory in the 2012 Vuelta al Pais Vasco is documented in one of the videos above. Sadly no one on the team has managed to win the Clasica San Sebastian. Many of the riders will find homes on other teams but we’ll miss the Carrot-related tweets from our friends in the Twittersphere where Euskaltel were regarded with much warmth and affection. No more #Carrots, #CarrotDown, #CrushedCarrots or #SaveourCarrots after October. 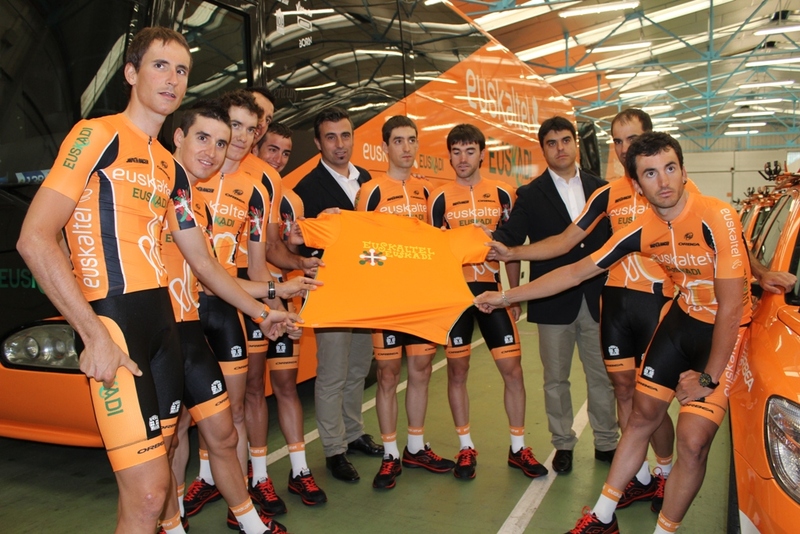 What I loved about Euskaltel-Euskadi was their support of cycling from grassroots to elite. Yes, it was anachronistic and parochial, but at the same time it was unique and there was something glorious in the way the organisation helped local youngsters, such as the Izagirre brothers, fulfill their dreams. Many of those feeder and associated teams are now also in jeopardy as a result of the economic crisis. Each year, Euskaltel produced a special orange t-shirt that was handed out to Basque fans on the Tour’s Pyrenean climbs, so the slopes look bathed in the marea naranja (orange tide). Let’s hope the fans continue to be both numerous and distinctive in Tours to come. There may no longer be a team to focus on, but there’s still plenty of Basque riders in the peloton who appreciate the fans’ fervent support. The finish line may be in sight but we still have two months left in the season. Let’s hope our beloved boys in orange manage to go out with a bang! Zorte ona (good luck)! I will miss the Orange shirted ones in the peloton – I love the fact that they have managed to perform at the top level for so long while persisting defiantly with their Basque only policy – a World Tour team made up of local heroes; it appeals to the romantic in me. Hopefully we will still see the flag waving Basque fans adding a bit of atmosphere to the mountain stages of the Tour and the Vuelta. Rest assured, the fans will continue to provide colour and excitement at both the Tour and the Vuelta, as well as their local races.There are after all plenty of Basque riders already on other teams such as Sky, Movistar and RadioShack. Just read your piece – great minds! I’ve visited the Basque country many times and I love the people, the culture, the countryside, the cycling and the cuisine. It’s well worth a visit! Great minds indeed. As i admit in my piece i know little about the Basque country and would love to visit -the combination of cycling and food sounds right up my street – i imagine the local riders would put me in my place on the climbs though! Once out of the major towns, cyclists easily outnumber cars. I’ve managed to keep pace on the climbs with a few of the old boys but none of the young ones!